Much as I've enjoyed many of the books I've read over the lst month or so, something has been missing. I've been in need of a good serial killer fix. Now, some of you may disagree, but as far as I'm concerned no-one does serial killer fiction like the Americans. I like British crime fiction, I like a bit of European crime fiction now and again, but for a really good serial killer you need to cross the pond. So, I picked up a little selection on Sunday at a car boot sale - all authors I'd never read before - and settled down for a good fix of serial mayhem. The first book off the pile, though it looked like a crime novel from the cover, turned out to be a romantic novel in disguise. The Murder Ballad by Jane Hill (she's British!) was a sheep in wolf's clothing. It was about a woman who meets an American folk singer, marries him with undue haste and moves to the backwoods of North Carolina with him. Unsurprisingly he turns out to have a few skeletons in his closet. It wasn't a bad book, and once I was resigned to the fact that there was ne'er a serial killer in sight, I kept going and enjoyed it in a half-hearted sort of way. Having just watched and loved the BBC's Folk Americana series I was interested in the old ballads that were mentioned throughout the plot, but you never got all the words or all the story. If you wanted to read a better book about traditional music (though these are set in Tennessee, not Carolina) then you should take a look at Sharyn McCrumb's Ballad series, and in particular, The Songcatcher (which seems sadly to be out of print in the UK). It charts the passing down of a song though the generations of a family. Much better fare. 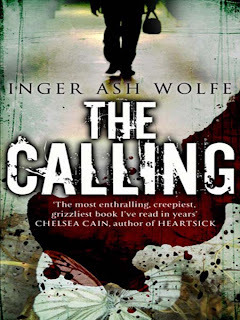 Still on my quest for sequential murder I picked up The Calling by Inger Ash Wolfe. This is actually set in Canada, not the US of A, but at least it has a killer, and he's onto his fourth (and I'm not even half way yet) so that definitely makes it a series. I'm liking the main character who is, unlike most detectives in this genre, a lady in her sixties living with her ageing mother. So far so good. This is different enough to pass muster, but it has those familiar markers common to the genre - mysterious killer (probably a sociopath), experienced police chief, rookie cop. Suits me.